Preheat the oven and mix the dough according to your chosen recipe. Divide your dough into smaller portions for tinting. Tint individually to your preference. 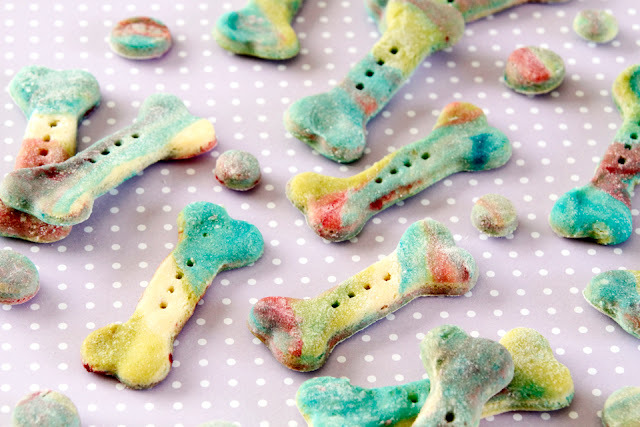 I used five colours to create the unicorn bones: neutral/plain, yellow (turmeric powder), pink (beetroot powder), green (wheatgrass powder), and blue (food colouring). 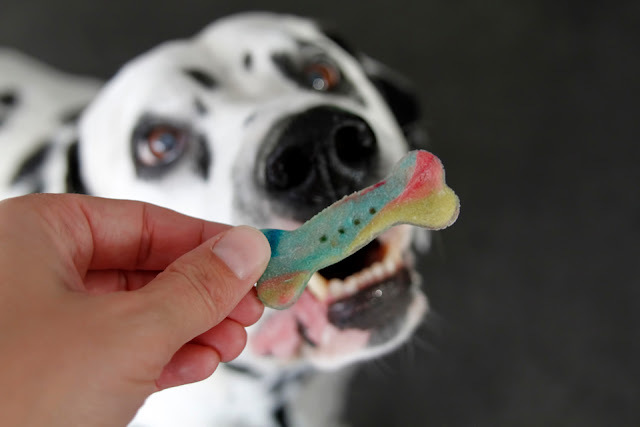 You can read more about tints and natural colourings for dog treats in this special post. Tip: Marbling is easy, but you need to take care not to over mix which will muddy the colours together. If this is your first attempt at marbling and looks are important to you (the dogs won't care! ), you might find it easy to experiment with a simple two colour mix first in tints that will blend together well if you overmix. Separate the dough into small pieces. You can rip and scatter by hand (I did for the treats shown, and do for most marbled treats) or by separately rolling each colour of dough flat (like these) which is a good way to make a finer marble blend. Whatever method you choose, ensure a good distribution for variety and don't make the pieces too tiny, else your marbling will be muddy when rolled. Gather the pieces together and squeeze into a loose ball. Tip: Since repeat reforming and rolling will muddy the marbling, you can keep some of your starting pieces aside to add back in on a later re-roll to extend the marble-life. Roll and cut into shapes. I used a basic bone cookie cutter for the treats and a small circle plunger for the little confetti bites. Tip: Since repeat reforming and rolling will muddy the marbling, cut your larger shapes first and the smaller-pieces from the gaps and any re-rolled dough. Confetti bites work perfectly for this! Chill if needed for your recipe, and then bake according to recipe. Cool before serving and storage. Tip: If you want to maximise the impact of your marbled colours, try not to brown your treats during baking. This may require lowering your temperature and/or adjusting the baking time. Cooling in the oven can help make things crisper, if you'd like, or you can pop baked treats into a dehydrator to dry them into a crispy cracker-like treat. :) And so doggone delicious too! 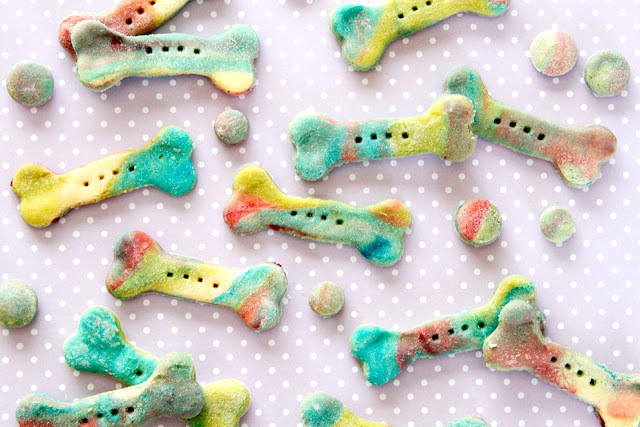 They're much easier to make than you might think - don't let their pretty looks deceive you. Thanks for the comment. Woofs!